After the instrumental album "Shape Shifter" in 2012, Santana reunited with producer Clive Davis, who produced the hugely-successful "Supernatural" and he once again used some guest artists on the album. This time, though, something that could not always be said of "Supernatural", "Shaman", or "All That I Am", this is very much Santana's album. He leads things and sounds really "up for it", so to speak. It is also a Latin album, not only in rhythm, but in its lyrics, which are in Spanish. It is an album of considerable vitality and shows an artist still hungry after all these years. 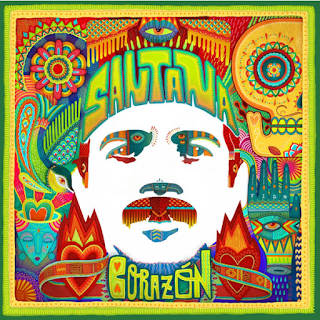 Some have criticised this for being just another Santana album, but, while sort of understanding that point of view, I have always enjoyed this album for the vibrancy I mentioned. The sound quality is great too. From the first moment, this is a captivating album. "Saideira" is an impossibly catchy and upbeat number - packed full of rhythm and superb guitar. It is a great, uplifting, summery track. For me, it blows away most of the stuff on "Supernatural". "La Flaca" has a delicious, laid-back bluesy feel. Material like this is as good as anything Santana has put out for several years. "Mal Bicho" is lively and Latin, but with some gruff ragga-style backing vocals too. "Oye 2014" merges the early seventies classic "Oye Como Va" with a hip-hop vocal and rhythm. It is ok, perfectly listenable, but I prefer the original, to be honest. One cover that does work, though, is that of Bob Marley's "Iron Lion Zion". It is punchy, bassy and features a killer guitar solo from Carlos. Marley's son, Ziggy, is on vocals, sounding just like his Dad. "Una Noche En Napoles" has a delightful female vocal and a shuffling, bossa-nova type beat. "Besos De Lejos" continues in a similar vein. The guitar intro to "Margarita" and its melody are sumptuous. A truly lovely track. "Indy" is a plaintive, contemporary-sounding slow number with an infectious bass line. "Feel It Coming Back" is a poppy, appealing song with a really catchy chorus. Santana's guitar at the end is stunning. Its Spanish version, "Amor Correspondido" (included on the "deluxe edition") is even better . It sounds a lot like "Destiny's Gate" by Tish Hinojosa. 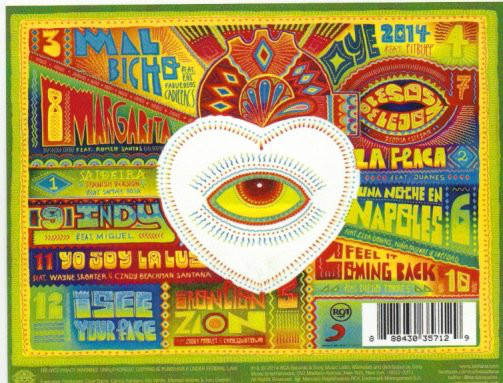 "Yo Soy La Luz" has some excellent Latin brass and a Brazilian samba section. There are some cool experimental, jazzy parts on here. Most enjoyable. "I See Your Face" is a "Borboletta"-style piece of ambient instrumental to close the album. As I mentioned in the main part of the review, this album contains some of Santana's best material for quite a while. Personally, I find it the most energising and vibrant of his post 1999 work.